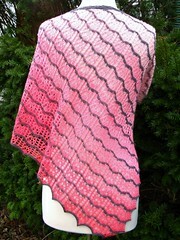 I designed and cast on for the third shawl in my upcoming three-shawl collection. Although I originally had a very sweet and romantic set of names picked out for these three designs, I have come to understand that they feel differently about themselves. I have heard authors talk about their characters having minds of their own, and subverting the plot, and now I feel I have experienced something similar. There’s nothing naive or light about these shawls — instead they bring to mind the current spooky season. I toyed with naming them after some of my favorite leading ladies of horror, but I worried about being too off-putting… and I don’t want them to be purely seasonal, either. I think I know the names now, but I’ll wait until I’m sure to announce them. I’m planning to do a mystery KAL with at least one of the designs — so I’m not putting too many pictures out there. I also received my September 2012 “Rockin’ Sock Club” shipment. This month’s sock pattern uses a toe that’s new to me, and a technique that’s new to me too! Nothing could make me happier or more intrigued. I’ve finished a good chunk of the first sock already. Whatever you name your shawls I’m sure they’ll be perfect. I love you designs, and am looking forward to the KAL!